03:06 — Doctor Who News – including a lot of undeserved ranting about Jo Whiley, who is a lovely person. 06:56 — Red Dwarf news. 07:51 — Electric Car Corner. 09:22 — Adendums – the Bat’leth. 10:32 — Tom Baker not dead…honest! 13:54 — Plugging The Good Place. 30:26 – The Game with No Name. 34:20 – Red Dwarf XII: Episode 4, 5 and 6. 43:09 – Star Trek: Discovery – Episodes 7, 8 and 9. 73:31 – Farewell for this podcast! 74:55 — End theme, disclaimer, copyright, etc. Wikipedia: Dark Eyes (audio drama). 02:11 — Doctor Who: New companions cast. 06:55 — STD: Itching for more. 08:45 — Star Wars: The Untitled Han Solo film finally named. 11:40 — Quantum Leap: Film script written but unwanted? 13:25 — Game of Thrones: Monopoly edition. 15:26 — Preacher: Renewed for a third season. 17:21 – Doctor Who: The Ultimate Adventure. 31:40 – Red Dwarf 12: Episode 3 (Timewave). 41:06 – 30 Second Recommendation: Stranger Things 2. 41:37 – Star Trek Discovery: Episodes 5 and 6. 58:06 – Emails and listener feedback. 60:13 – Farewell for this podcast! 61:40 — End theme, disclaimer, copyright, etc. Wikipedia: Solo – A Star Wars Story. Big Finish: The Ultimate Adventure. Wikipedia: Doctor Who – The Ultimate Adventure. 03:42 — Doctor Who: Shada back for more. 07:00 — Hitchhiker’s Guide: Hexagonal Phase incoming. 09:28 — Trevor Martin: DEAD! 11:51 — Doctor Who: S11 changes rumours. 15:07 — Dredd: Karl Urban has demands before returning to the role. 16:14 — Stranger Things: Eggo card game. 17:33 – Doctor Who: The Seven Keys to Doomsday. 29:46 – Red Dwarf 12: Episodes 1 (Cured) and 2 (Siliconia). 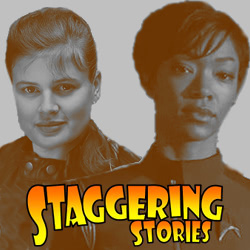 40:58 – Star Trek Discovery: Episodes 3 and 4. 54:15 – Emails and listener feedback. 66:34 – Farewell for this podcast! 67:34 — End theme, disclaimer, copyright, etc. Wikipedia: The Hitchhiker’s Guide to the Galaxy. Big Finish: Seven Keys to Doomsday. Wikipedia: Doctor Who and the Daleks in the Seven Keys to Doomsday. 03:01 — Red Dwarf: Series 12 ready to launch. 03:31 — Doctor Who: New mobile game. 04:22 — Terminator: Yet another continuation trilogy planned. 06:59 — Good Omens: Another cast member announced. 08:43 — STD: Spock’s mummy is cast. 11:16 — Rick and Morty: Szechuan sauce back on McDonald’s for one day. 12:18 — Doctor Who RPG: Unofficial Fifth Doctor sourcebook. 14:02 – Star Trek Discovery: Episodes 1 and 2. 38:17 – Doctor Who: Earth Aid. 49:42 – Emails and listener feedback. 58:07 – Farewell for this podcast! 59:13 — End theme, disclaimer, copyright, etc. Tiny Rebel Games: Doctor Who Infinity. Big Finish: Doctor Who – Earth Aid. That glutton for punishment, Captain Jean-Luc Picard, brings his Secret Log up to the beginning of the second year of their grand voyage. 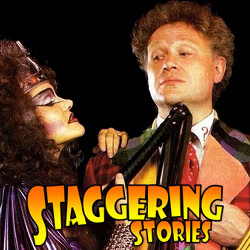 Originally appearing the the fanzine Star Begotten, in October 1989, then migrating to Private Lives, as run by a certain Siobhan Gallichan and then finally reprinted on the Staggering Stories website. 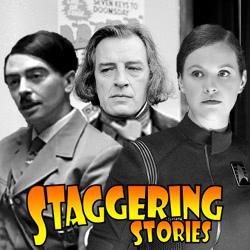 Later episodes will be committed to audio in time but if you’d wish to read the other episodes now then they can be found at: http://www.StaggeringStories.net/secretlog.html. A big thank you to Siobhan Gallichan for performing the narration and production and, of course, Tim Munro for allowing us to bring this to you. 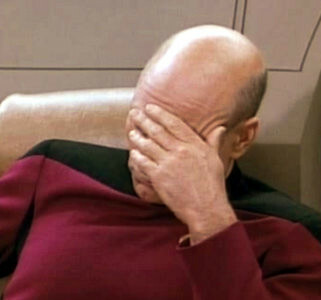 Warning: There is some strong language in this MP3 (but then Picard never did mind his French).